As I previously mentioned, the Internet in Missouri was sub-par. There was no way I could post any pictures. I haven't done a very good job of taking them, but posting them has been a major challenge. 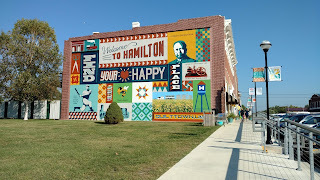 While staying in Maysville's "no where" campground we did take a ride to Hamilton, MO twice. 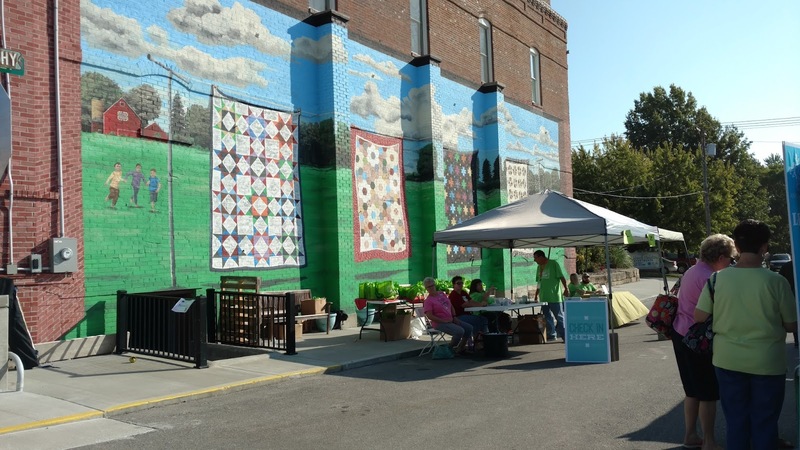 It's the home of Missouri Star Quilt Company. We went on Thursday afternoon to get an idea of the town and shops there. The town was tiny, but all things quilty. 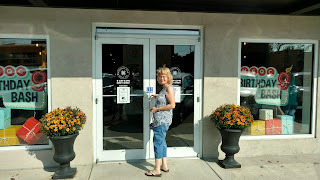 It was busy with people shopping and we lucked out and found a newly vacated parking spot in from of their Main store. 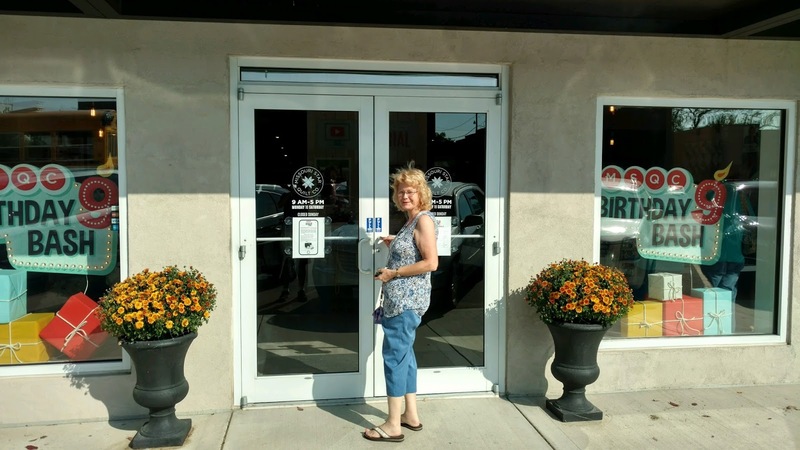 David decided he had to take a candid picture of me entering the first shop. This shop must have been recently redecorated and remodeled. Everything smelled new and it was nice and bright and open. 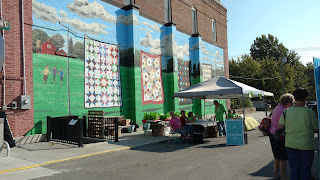 Beautiful flooring and nicely hung quilts, displays and little samplings of quilt fabrics from each of their 13 shops. They had copies of all of their books and individual copies of their patterns that were well written. I did get a few of their patterns since most of their patterns were inexpensive and called for jellyrolls and charms packs. I typically don't buy jellyrolls, charm packs or layer cakes, but I have a lot of fabric that can be cut and used for scrappy quilts and their patterns fit the bill. I quickly toured all the shops except the Machine Shed and a few on the top floors and we came home. Bentley had a nice stroll around the campground. The next day I went to Hamilton early in the morning alone. David decided he would sit this one out. He can't understand why I can't go in and just buy something and leave. That's not the way it works AT ALL. A big part of the enjoyment is looking at and thinking about what you could do with ALL of that fabric and then TRY to narrow it down to just a couple of selections. It's not like shopping for an IPA beer for goodness sake. It was Friday and day 2 of their 3 day Birthday Bash. It was just a coincidence that I was their on that day.Lucky Me. I thought I was early and would beat the crowds, but I was so wrong. I arrived at 9:15 and there were already bus loads of people there. I decided I wanted to visit all the shops first again before selecting anything because I decided to limit my spending. I prefer to spend my money at home at my local shop which has a wonderful selection of great fabrics and patterns..
Each of the 13 shops at MSQC had a different theme. The Main shop was a central shop with a little of everything. Penney's Quilt Shop which was an original JC Penney's store (as Hamilton was his home town) was solids, blenders, and Minky fabric. Every color and hue you could think of. The Sew Seasonal shop was upstairs and had Holiday fabrics. Missouri Star Mercantile has 1930's, Civil War repro fabrics and vintage style fabrics. License to Sew had all licensed fabrics like Disney, sports teams, cartoon characters or movie themes. Kids and baby store had kids and baby fabrics. Modern had tons of Kaffee fabrics, and similar. Backing & trims had that. The Floral store was just that, all florals in every color, design possible. This was my favorite store and by the number of people in it, it was others favorite also. When I walked in there was a lady standing at the first selection of bolts looking glassy eyed at me and fondling a bolt of fabric with a big smile on her face. Most of the other customers were doing the same. This poor woman had just stepped inside and was already in a trance. She was never going to make it through that store at that rate. I did find some beautiful dragonfly fabric and when I took it to the cutting table a happy smiling lady said, "we must think a like, I just got some of that same fabric". I never saw so many happy, smiling women. For the men that didn't know what they were getting in to there was Man's Land. It's a "store", not really full of leather recliner chairs with a big screen TV and magazines for the guys to relax while the ladies shopped. I did however see a few men in the shops. More often than not it was a husband coming in to find his wife, wondering why she had been in there so long fondling fabric. They just don't GET IT. Then there was the Machine Shed where you could buy a new machine. And the Sewing Center where you could sit and sew or have a class or retreat. There you have it. 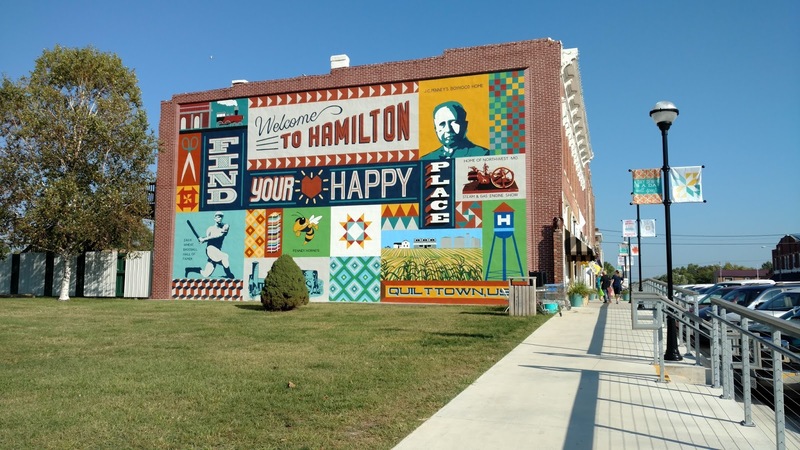 Hamilton is certainly a great quilt stop. The prices were good and the staff couldn't have been nicer. MSQC has done a wonderful job in revitalizing this town. I thoroughly enjoyed the visit, but not the area.